and the World Bank states that from 2005 to 2012, 179 ships were successfully hijacked off the Horn of Africa, primarily off the coast of Somalia. Another study, called ‘Pirate Trails’, using data and evidence from interviews with former pirates, government offi cials, bankers and others involved in piracy, explores the fi nances behind piracy and claims that over $339 million in ransom was paid during that period of time. Management Practices IV, such as ‘hardening your ves- sel’ by installing barbed wire to protect the hull and create an effective Citadel aboard ship. 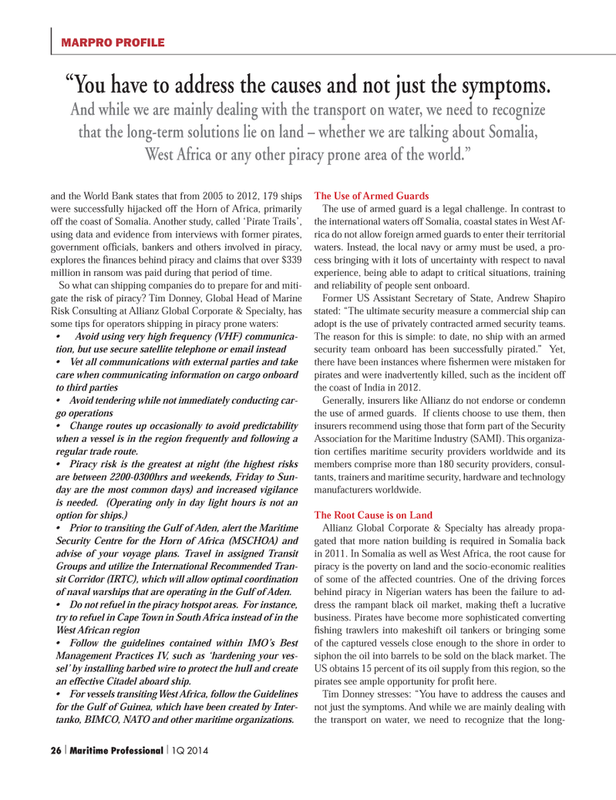 For vessels transiting West Africa, follow the Guidelines for the Gulf of Guinea, which have been created by Inter- tanko, BIMCO, NATO and other maritime organizations. The use of armed guard is a legal challenge. In contrast to the international waters off Somalia, coastal states in West Af- rica do not allow foreign armed guards to enter their territorial waters. Instead, the local navy or army must be used, a pro- cess bringing with it lots of uncertainty with respect to naval experience, being able to adapt to critical situations, training and reliability of people sent onboard. Former US Assistant Secretary of State, Andrew Shapiro stated: “The ultimate security measure a commercial ship can adopt is the use of privately contracted armed security teams. The reason for this is simple: to date, no ship with an armed security team onboard has been successfully pirated.” Yet, there have been instances where fi shermen were mistaken for pirates and were inadvertently killed, such as the incident off the coast of India in 2012. Association for the Maritime Industry (SAMI). This organiza- tion certifi es maritime security providers worldwide and its members comprise more than 180 security providers, consul- tants, trainers and maritime security, hardware and technology manufacturers worldwide. US obtains 15 percent of its oil supply from this region, so the pirates see ample opportunity for profi t here. MARPRO PROFILE VICE ADMIRAL WILLIAM BURKE (RETIRED) “You have to address the causes and not just the symptoms.